The sub tanks ink delivery system is a very useful feature that is neglected when comes to printer reviews. 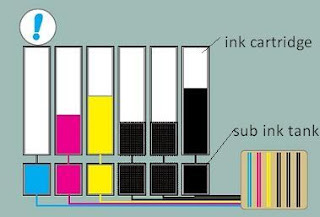 Very often the users see the sub tanks ink delivery system is to enable replacement of ink cartridges while the printer is printing. But, this is not the only feature that the sub ink tanks are meant for. The truth is a large format printer that built in with sub ink tanks in its ink delivery system will deliver better ink efficiently and it is much economical as compared to another wide format printer that does not comes with sub tanks. If you are existing users of HP Designjet 111, HP Designjet 510, Canon iPF605, Canon iPF710 or any other inkjet wide format printer that does not built in with sub ink tanks, you will found that the empty ink cartridges that were ejected from your plotters is not really empty. In fact, there is still remaining of a few milliliters of precious ink in the so-called empty cartridges. Why? An ordinary inkjet system consists of ink cartridges (inlet), tubing and printhead. To ensure smooth ink delivery within the system, air bubble is the culprit that the designer trying to avoid. To ensure no air bubble is captured in the ink system, the designers of the printer will not allow the ink cartridges to be fully drain because once it is done, air bubble will be created in the ink delivery system, and the printer will need to purge the ink till the air bubble is out. Hence, with a inkjet printer that does not comes with sub ink tanks, the ink cartridges will not be allowed to fully drain. In short, the users are actually throwing out a few milliliters of ink every time a cartridge in change. With the built in of sub tanks, no bubble will be able to smuggle in the ink tubes because the ink is supplied by the sub ink tanks instead of directly from the ink cartridges. Hence, it enables full use of ink tank contents, eliminating waste ink. A part from more economical ink consumption, the sub ink tanks system is constantly reserving a preset ink level in the sub tanks which allows users replace ink tanks without having to stop printing. Even when ink runs out unexpectedly, users can continue printing using just the sub tanks. (Example: equivalent to approximately 80 sheets of A1 plain paper for monochrome drawings).